You have seen Jackie's clients on Daredevil, The Get Down, Power, Blue Bloods, Boardwalk Empire, Gotham, Orange is the New Black, Law & Order SVU, Girls, The Good Wife, The Blindside, Friends with Benefits, and many more. If you're not able to pay the full price upfront, you can pay a Non Refundable Deposit of $100 to reserve your seat for one class. If you're interested in coming two days, you must pay the non-refundable deposit of $100 per day you would like to reserve for a total of $200. The remaining balance is due by Monday, March 7th. An invoice with your remaining balance will be emailed to you if you paid a non-refundable deposit. All Registration must be completed and paid in full by 11:59 pm on Monday, March 7th. A payment must be made to secure your seat. Each intensive will start with a brief Q&A with the industry guests. Next, each actor, one by one, will go into a separate room with the guests to perform their scene on camera. 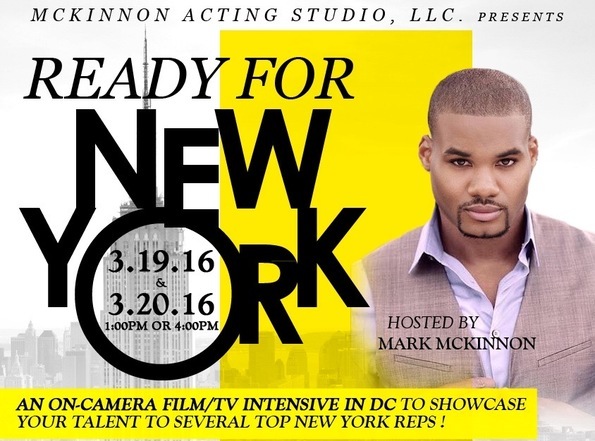 After receiving coaching and feedback, the actor will get to do their scene a second time. All other actors in attendance will be able to watch your performance live on a flat screen while you're in the room with the guests. Once you complete registration and make a payment, an email with a link to dozens of good film / TV scenes will be provided. You also have the option to bring in and use your own scene instead of using one from our link. The scene must be no more than 2-3 pages and be from a TV show or film. No scenes from plays / theatre shows. If you are registered to come two days, you may use the same scene both days being that each day will have a complete different panel. You are welcome to use a different scene each day. -Space is limited. Only 12 seats available per intensive. - Each intensive is two hours. -You may only arrive to the venue on the date and time slot you are registered for. - Early Bird Price must be paid in full by January 22th, 2016 at 11:59pm.